Phoenix Sylvestris Palm Trees are named after two Latin words Phoenix and Sylvestris combined, which means “date palm”and “of the forest” respectively. This species is also known as silver date palm, Indian date or sugar date palm in India or wild date palm. It is a flowering plant which belongs to palm family. The fruit is purple and red when it’s ripe. Phoenix Sylvestris Palm Trees are mostly found in Pakistan, India,Bhutan, Nepal, Burma, Sri Lanka and Bangladesh. It also supposedly grows naturally in Mauritius, Puerto Rico, the Chagos Archipelago and the Leeward Islands. The plant grows 1300 m above sea level in plains and wilds and its fruits are used to prepare wine and jelly. The sap of this plant is used to make jaggery in Bengal region of India and Bangladesh. Sugar and alcohol are made from its flowers and jelly is created from its fruit. Phoenix Sylvestris Palm tree generally measure around 4 to 15 cm in diameter, with curved leaves almost 3 m long. The leaves form a crown shaped structure with roughly 100 leaves, at the top of the plant which can grow up to 10 m wide and 10 m tall. The leaves can be used to make handicraft items like handbags and mats. Phoenix Sylvestris Palm trees grow slower around 1 to 3 feet per year but can reach above 40 feet. Phoenix Sylvestris Palm Trees are low maintenance plants and only requires trimming of dead leaves. It is advised to take extreme precaution while trimming the leaves of Phoenix Sylvestris Palm tree as it has sharp edges. This plant grows best when watered regularly.However, it can endure a drought for a short duration. It grows best in the moist and well-drained mud. This plant has gained its popularity in landscape market due to its low upkeep and attractive appearance. Many landscapers are spending on this one of a kind palm tree on golf courses, on streets, and as center pieces for luxury houses. Phoenix Sylvestris Palm Trees is popular from Georgia to Oregon. After reading so much about Phoenix Sylvestris Palm Trees, you might have started planning your garden’s landscaping. You must be wondering, where to buy Phoenix Sylvestris Palm Trees for your home. We at Quality Palms will take care of your worries. You will be delivered excellent quality Phoenix Sylvestris Palm at your door step. Our guarantee to quality and customer service is impressively valued in the garden redesigning business as we always keep up with the changing requirements ordered to us all year long. 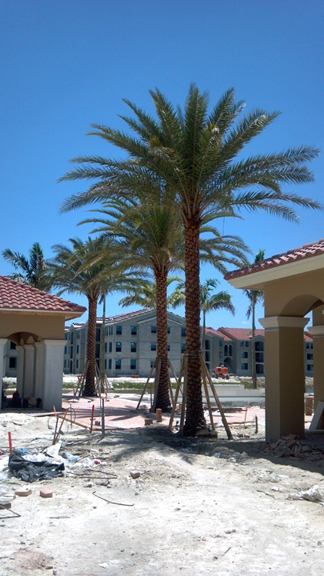 You will never have to ask anyone ever again about where to buy Phoenix Sylvestris Palm Trees. Happy Landscaping! !